Gloriavale mother of 11 drowned in 15cm of water? Rejoice Stedfast allegedly drowned [in 15cm of water] in Haupiri River, near Gloriavale in the Grey District on the South Island’s West Coast. The body of Rejoice Stedfast, mother of 11, was recovered from Haupiri River in the Grey District earlier today. In the best of NZ police tradition, a police spokeswoman said the death was not suspicious and that it had been referred to the coroner. Sincere Standtrue, 20, died in early November, less than two weeks after suffering a medical event at Gloriavale on October 23, a report said. Is Gloriavale an intelligence community concern? Last week, former US Navy engineer Howard Temple was confirmed as the new head of the community. One person was killed in a fatal crash that occurred at about 2.25pm on Waiuku Road this afternoon. A serious crash occurred on Ponga Road near Opaheke at around 9am this morning and involves three motorcyclists. “One rider is in a critical condition and is being taken to hospital,” police said. One person was killed in a single-vehicle crash in Devon Road, New Plymouth at around 11.20pm last night. “There is no information available for release at this stage regarding the deceased person,” police said. A pedestrian was violently killed when they were hit by a train on Gloucester Road about 9.45pm, police said. “One person is dead following a crash on Rongotea Road in Manawatu at around 1am today. “The crash involved two cars, with a total of six occupants. “Two people have been found deceased and another person has critical injuries after a crash on State Highway 2 at Nuhaka, east of Wairoa. “Two men have been critically injured in a crash on Ormond Road in Hastings this morning. How many bodies discovered by police in the Woodend property since Thursday, one or two? Two people have been found deceased and another person has critical injuries after a crash on State Highway 2 at Nuhaka, east of Wairoa. Emergency services were notified of the two-vehicle crash just after 8pm. A helicopter has transported the injured patient to hospital. Police can now release the name of the woman who died in a crash between a car and a truck on State Highway 3, Otorohanga, shortly after 11pm on June 25th. She was 27-year-old Charlotte Ashton of New Plymouth. Police can now release the name of the man who died following the crash on State Highway One at Utiku, south of Taihape yesterday. He was Wayne Robert Hughes from Whanganui. Police can now release the name of the woman who died after she was hit by a car on Akatarawa Road, Upper Hutt, just after 2pm on 26th June. She was Charlotte Uduwawidanalage Dona of Upper Hutt. Police can now release the name of the man who died in a two car crash SH2 at Waitakaruru, Waikato around 11am on Sunday 24th June. He was Robert John Critoph of Waiterimu. Police can now release the name of the man who died after he was hit by a car on Tasman Road in Hamilton around 6pm on Tuesday 26th June. He was Warren Stanley Paul Bell of Hamilton. What do 13 heads of state and hundreds of wealthy criminals have in common? 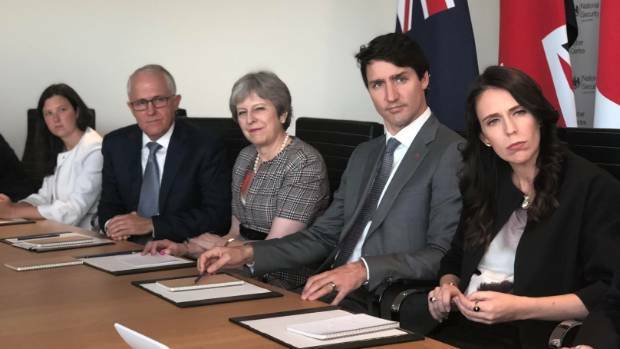 At least 13 heads of states and hundreds of wealthy criminals and influential persons have laundered their ill-gotten gains through New Zealand entities, insider sources say. Friday, 20 April 2018 – Police and emergency services were called to the scene of a “sudden death” on a farm in the Central Hawke’s Bay, where the found a man near a motorbike at 5am this morning, 20 April. “Police were called to a residential address in Fletcher Place, Upper Riccarton, where a woman was found deceased in the early hours of this morning. How Justice Anne Hinton Fucked the Laws of Natural Justice! Driver of a third vehicle received serious injuries including multiple leg fractures and had to be cut from his van. Do You Have Faith in the Zombie Legal System? 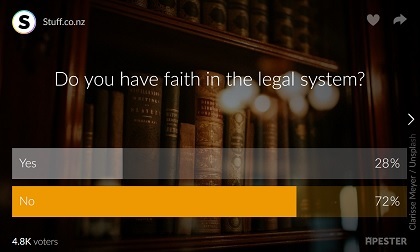 Some 72% of people who responded to a poll said they had no faith in NZ legal system! Three people were effectively murdered by police near Nelson this morning. Two of the victims were from a vehicle “fleeing” police and the third victim was a member of the public who was killed in The Final Destination style. The murderous police in NZ have but one aim every time the opportunity to kill presents itself. The “Independent” Police Conduct Authority (IPCA) has apparently been notified of the killings. However, the chances are they will find the murders justified, as they have in almost every similar incident previously. 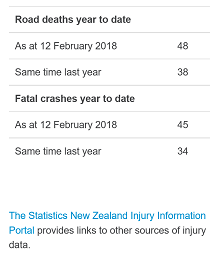 Our advanced statistical models show police have reported only 45% of road fatalities that have occurred in NZ so far this year. 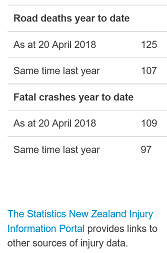 That’s only 99 fatalities out of 220 (margin of error ±3 percent). 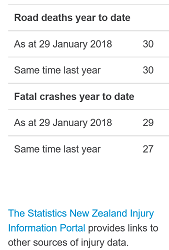 Additionally, only 25 out of hundreds of critical injuries have been reported since January. The man came from a poor family in the Punjabi village of Talwandi Salbo, according the Indian Weekender. On average, three foreigners are killed in New Zealand every 4 days, but many of the deaths go unreported. Dr Jane Morgan from the Hamilton Sexual Health Team said 400 cases of syphilis were voluntarily reported by sexual health clinics throughout the country, up from only 80 reported cases in 2012. However, there were a lot of other cases that are not being reported, Morgan said. What makes NZ so green? “One person has died following a crash between a car and a tractor on Bankier Road in Horsham Downs around 11.20am today. “One person is dead following an incident involving a train and an off-road vehicle between Katikati and Tauranga around 8:20pm tonight. Three people were believed to be in the vehicle at the time of the crash. A person has died and a second is in hospital after their car plunged down a bank in Canterbury this morning. No of incidents reported by police since February 20: ONLY 4. Road Crash Victims Nos. 142 to 145 and 151 to 155 have not been identified by police. Police can now confirm the body located in Rototuna, Hamilton, on Saturday 17 February was Raymond Stirling. A 21-year-old man has been charged in relation to the death of a woman in Tauranga overnight. Murder Mystery? Were police involved again? What really happened to Siegfried Newman (Siggy)? “Police accounts of what happened to Katikati father of two Siegfried Newman, who went missing 10 years ago on February 25, are at variance with each other.